If Lindsay Frucci is half the motivational speaker she is as a motivational writer, she should be taking her talk nationwide and firing up would-be entrepreneurs across America! That’s what I thought when I read the first 315 pages of THE PIG & ME, A MEMOIR. 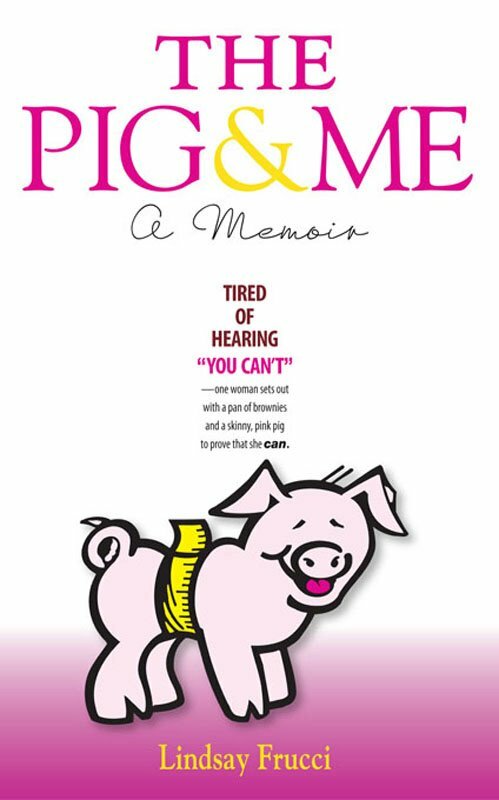 "Tired of Hearing 'You can’t'--one woman sets out with a pan of brownies and a skinny, pink pig to prove she can." After the Fruccis lose everything to bankruptcy, Lindsay decides she’s going into a business that will make gobs of money, thus reclaiming her children’s college education fund, her lost 401 retirement plan and regaining the family’s overall sense of financial security. How’s she going to do that? She decides to turn her passion for fat-laden fudgy brownies into healthy brownies for the masses. That’s how! She founded No Pudge! Foods, Inc. and began the journey of her life which she recalls in her book THE PIG & ME, A MEMOIR. Lucky us, we get a front row seat with Lindsay as she recounts the ups and downs in an entertaining fashion from the very beginning. Her own husband wasn’t a believer; it took a couple of retired grocery store guys named Jay and Bob to hop on board to get the pig moving forward! And did it! All across America! Starting in New Hampshire, where Lindsay lived, to small grocery stores around New England, then into the Southeast, the Midwest and Trader Joe’s in California. It took years, but slowly No Pudge! Foods, Inc. began to “pork” out. When her husband, Paul, saw an article about his wife and her “little company” splashed across the Wall Street Journal even he came around. But it’s a funny thing about life. Just when you think you have it all together: The kids in college, everyone’s healthy, you’ve sold your business and there’s money in the bank...well, you know where I’m going with this. Real life happens in THE PIG & ME, A MEMOIR. And there are real people dealing with it: Lindsay, her husband, Paul, their two sons, AJ and Adam. However, the way they deal with it is what makes this memoir special, unique and worth reading. You can find Lindsay Frucci at her Facebook page and at her website. Guess what?!? Lindsay is giving away SIX paperback copies right here! And anyone in the world has a chance to get their hands on one. Please tell us: If you were to start a business, what kind would it be? Please include your e-mail address or another way to reach you if you should win. Giveaway ends November 15th at midnight EST. but sometimes i want to sell clothes too. I would love to start a social media/PR gig that caters to small and local businesses. Actually I am really starting my business soon, if everything goes according to plans. I will be opening a Beauty Salon. I was thinking a LOT about whether I should do this..But, I somehow feel I want to create something which will allow my child do have a better future. There are many unemployed in my country, and I don't want this to happen to my son, so me and my husband decided we should invest in something. I love seeing people happy, and Beauty Salon is surely a place where you see lots of happy people. It's like in Paradise, at least I think so. I love reading these kinds of books, and Lindsey's story sounds so inspiring. I would love to read it! If were to start a business it would probably involve dolls. I'd probably start a Housekeeping Agency. There seems to be such a demand for someone to come in & DO during the week. I know a lot of friends & family who hire someone to help out for a set number of hours each week & for special jobs. Either my own beauty line or book publicity/PR firm. I would start a restaurant... Nothing better than good quality food! I would start a translation agency since there's always a great demand for good translators here, in Europe. I´d like to own my own little bookshop. Like the "Shop around the Corner" in "You´ve got Mail". With readings for Children and an area to enjoy a cup of tea. And hopefully not being taken over or closed by a big chain ;). I think I would want to start some sort of business where I could do taxes for people. I do that for everyone anyway. It seems people don't want to try it themselves or pay too much for it somewhere else. Either that or some kind of daycare since I love being around kids! If I were to open a business, it would have to have something do do with books, computers, and kids. Not sure if it would be a book store, a class, or what. Or one day I'd like to be able to go back into teaching. I know, I know, I'm quite the over-achiever! LOL!! I just finished this book and am still reeling from the rollercoaster ride of Lindsay's professional journey from a stay-at-home mom to Brownie Queen! She is truly inspiring. What a brave, wonderful woman. "If you want something you've never had, you must do something you've never done."